As the Internet celebrated the fourth anniversary of Giving Tuesday on Dec. 1, TEMPOE took time to reflect on the past year full of new philanthropic endeavors. Giving Tuesday falls on the first Tuesday after Black Friday each year and is meant to serve as a reminder to the importance of giving, thanks, and philanthropy during the busy holiday season. In 2015, TEMPOE had an increased desire to make corporate philanthropy a priority. And as a company fortunate enough to have multiple locations, we increased our impact around the country. Our first corporate sponsorship was with the Angelman’s Foundation. Named for the English pediatrician who identified it, Angelman Syndrome (AS) is a rare neuro-genetic disorder that occurs in one of every 15,000 live births. Characteristics include developmental delay, lack of speech, seizures, and walking and balance disorders. It is often misdiagnosed as cerebral palsy or autism, due to a lack of awareness. Despite these constant challenges, individuals with Angelman Syndrome have a happy demeanor, laugh frequently, and often smile. This particular organization hit close to home, because two of our employees have affected children. On May 16, TEMPOE’s New Hampshire team walked in honor of Colette Cusson’s son Michael in Plymouth, Massachusetts, and the Ohio team walked in honor of Shawn Fields’ daughter, Megan. Altogether, TEMPOE raised more than $2,500 for the Angelman’s Foundation. We will continue to work with this organization, so stay tuned for news on the annual Spring walk in 2016. This Fall, we doubled our efforts to include charitable events for two different organizations that we support. For the first of these, a small group of the toughest TEMPOE employees formed TEAM TEMPOE to participate in the Great Northeast Tough Mudder on September 27 in Westbrook, Maine. The Tough Mudder runs for 10–12 miles, and is a team-oriented obstacle course designed to test physical strength and mental grit. With obstacles called the Arctic Enema, Electroshock Therapy, and Ring of Fire, it’s definitely NOT for the faint of heart. Altogether, Tough Mudder participants have raised more than $6 million for the Wounded Warrior Project (WWP). The WWP’s vision is to foster the most successful, well-adjusted generation of wounded service members in the nation’s history. They have programs to help wounded veterans mentally readjust to civilian life and ensure that they receive the proper medical care. 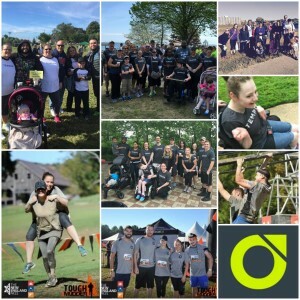 TEMPOE created a Tough Mudder fundraising page to solicit donations for the WWP and our TEMPOE team members participated in honor of wounded warriors. With some extremely generous donations from the TEMPOE team, we raised $1,270 for the WWP. The second charitable event we participated in this Fall was a pair of NAMI walks. TEMPOE had teams participate in the Concord, New Hampshire, and the Butler County, Ohio, walks. NAMI, the National Alliance on Mental Illness, is the nation’s largest grassroots mental health organization, dedicated to building better lives for the millions of Americans affected by mental illness. The organization started as a small group of families gathered around a kitchen table in 1979 and grew into one of the nation’s leading voices on mental health. Today, NAMI is an association of hundreds of local affiliates, state organizations, and volunteers who work in dozens of communities to raise awareness and provide support and education that was not previously available to those in need. TEMPOE is proud to have been a Bronze-Level Sponsor in each of the NAMI walks, raising a total of $2,270 for NAMI.